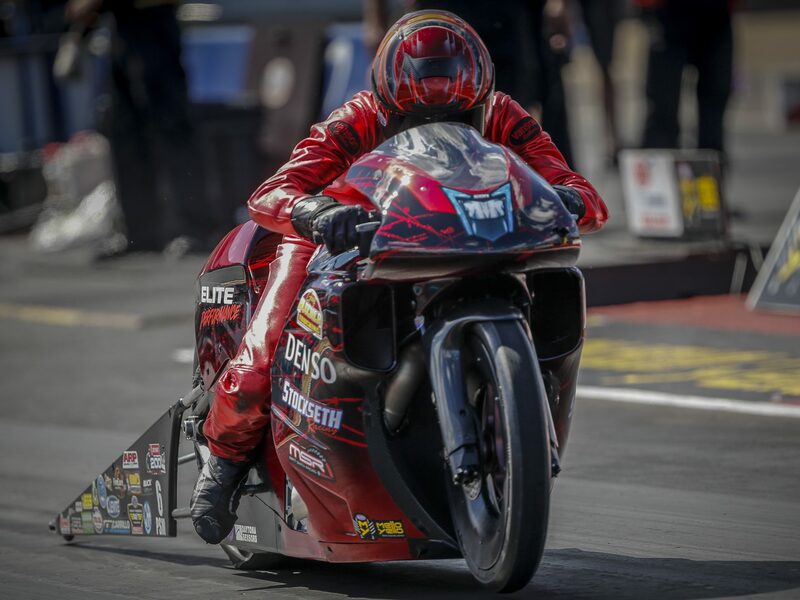 Matt Smith, current points leaders, finished atop the qualifying order in Pro Stock Motorcycle with a 6.876 at 197.65 on his Elite Motorsports DENSO Auto Parts EBR. He is chasing his fifth No. 1 qualifier of the season and second of his career at Texas Motorplex. Pro Stock Motorcycle — 1. Matt Smith, EBR, 6.876, 197.65; 2. Hector Arana Jr, EBR, 6.882, 195.45; 3. Eddie Krawiec, Harley-Davidson, 6.892, 195.25; 4. Angelle Sampey, Buell, 6.906, 194.86; 5. LE Tonglet, Suzuki, 6.915, 194.83; 6. Steve Johnson, Suzuki, 6.922, 194.41; 7. Jerry Savoie, Suzuki, 6.930, 195.22; 8. Angie Smith, Buell, 6.938, 193.02; 9. Ryan Oehler, Buell, 6.938, 189.84; 10. Joey Gladstone, Buell, 6.943, 193.65; 11. Hector Arana, EBR, 6.946, 195.45; 12. Andrew Hines, Harley-Davidson, 6.950, 194.97; 13. Scotty Pollacheck, Suzuki, 6.950, 193.93; 14. Kelly Clontz, Suzuki, 6.982, 191.95; 15. Karen Stoffer, Suzuki, 7.066, 188.07; 16. Anthony Vanetti, Buell, 7.855, 182.85.